The term color values refers to the lightness or darkness of the colors associated with an object. "value", but the effect of value is most noticeable in the leaves and flowers that make up the body of a garden. Value is closely related to color, though color does not have to be present for value to exist. 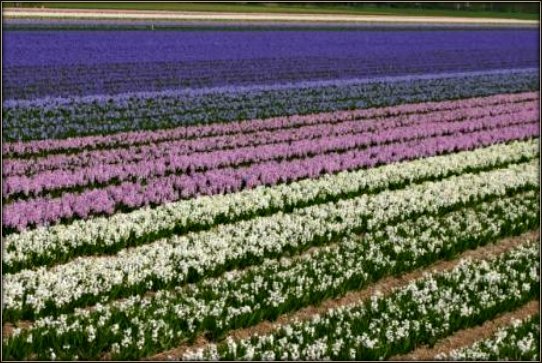 The photo below shows a whole range of values, the color of the tulips depicted ranging from lighter values [white], to very dark values [deep blues and purples]. This wide range of values is found inherent in nature. 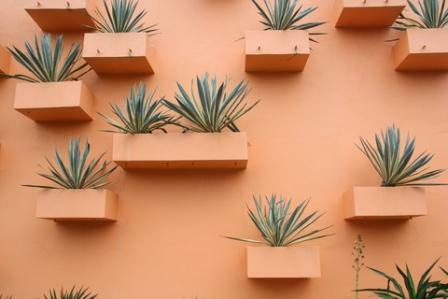 Two plants may have green leaves; one plants "value" may be quite pale and retiring, while the other plants "value" may be very intense and "dark" in relationship to the first. 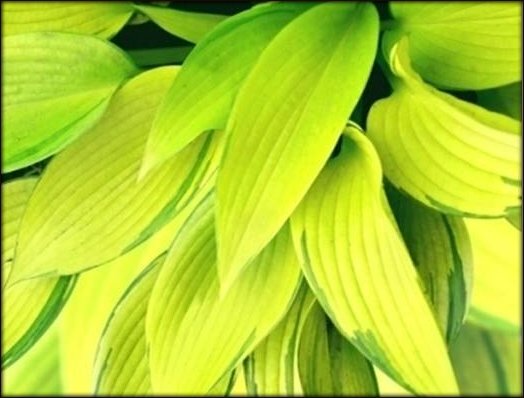 Here are some examples of three hosta varieties which demonstrate the range of color value available in green leaved plants. Similarly, in a set of purple plants you may find a similar range of color values, here depicted from lighter to darker values. 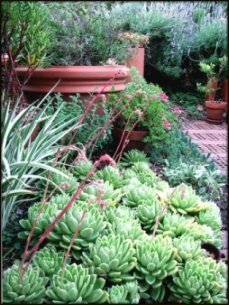 These differences in value can be used to great effect in the garden to create a sense of distance, to reinforce visual garden design balance, or to cause a focal point, to visually advance toward the viewer. Note that the actual colors themselves are not what are being demonstrated here. While each of these photos does have a distinct color, the value of each set, both the green/gold and purple lineups, range from light to dark. The color value of each of the pictures on the left is lighter, the middle pictures showing mid-range values, and the right hand pictures demonstrating darker values. Value as a characteristic is found in most things typically seen every day. Value is what makes a color seem light or dark to you, and it greatly affects the way we see the world. Here you see value demonstrated in two rock walls. Again the values represented are first light values to the left of the photo, and to the right, darker values. but the value characteristics of the rocks on the left are so light that the rocks appear to be more tan in color. The rocks on the right retain the darker value characteristics, thus they appear to be red. behind, bright orange, and then at the rear of the picture, you see the darkest of the three values, a deep burnt orange color. Throughout the plant kingdom, this wide range of values is discernable. 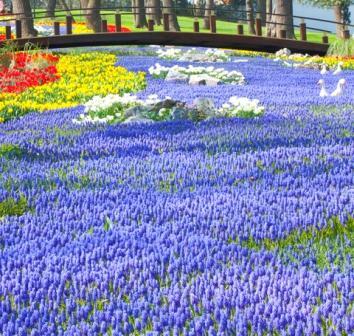 Plants from tulips to daisies come in a range of color values that is dizzying to behold. This is a powerful tool in the hands of a designer who understands values. A designer who takes into account value in their design can create dramatic effects with value manipulation. In the photos above, note the different sense of drama within each. 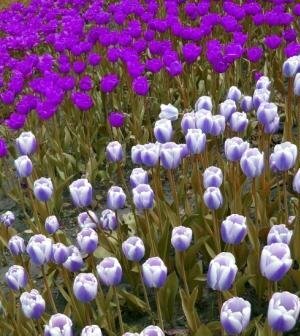 Both have a real dramatic flair, yet in the photo on the left notice that the lighter purple color advances strongly toward you, while the darker purple tulips seem to retreat from your view. The photo on the right is also dramatic, but its drama is very different than that of the tulips on the left. All of the colors in this photo are in the mid to dark range of values, and you will note that in spite of the photos filtered background treatment, the lighter colors still advance in the photo. These deep but bright color values create a dynamic sense of tension that is entirely lacking in the photo on the left. Look at the diverse effects that you can create in the following series of photos! 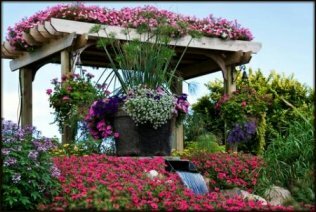 See how powerful understanding value can be in creating a mood in your garden? Value can also be used to create a high sense of drama in an otherwise uneventful space. Here, in this vivid and colorful scene, the white sculpture [light value] becomes a focal, as it stands at the head of a river of deep blue grape hyacinth [dark values]. 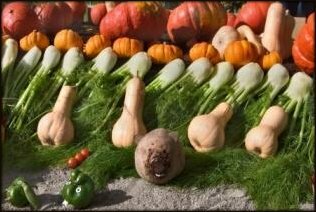 This is largely due to the dramatic difference in value from all of the surrounding plantings. Even if the blues in this scene were a deep red or bright orange value, the white would still become the emphasis point, since its value is greatly different than the values surrounding it. 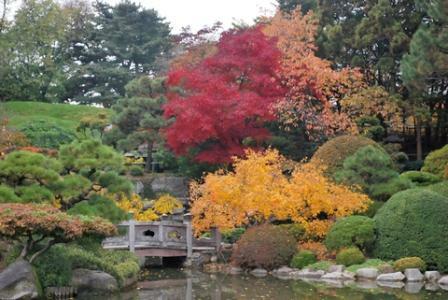 In the following Japanese garden, we see a similar effect, used more subtly, and with a broader brush, but the brighter yellows advance, provide a contrast to the red, which due to its intense color value, is the emphasis point in the garden. In the following garden, again we see a similar effect, much more subtle and quiet than even the somewhat restful scene in the Japanese garden above. Note that the intense green values are nearly equal in value to the bright red/orange leaves in this photo. A skillful use of value creates a quiet and restful sense, instead of the jarring effect that might have been achieved with less intense greens surrounding the tree in the center of the photo. In this next set of photos, we can again see the difference in effect. Both photos are of a field of tulips. Yet the effect of the gardens is very different. In the first photo, note that the color range is very tight. 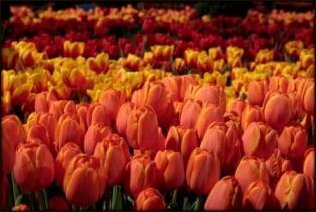 All of the tulips pictured in this photo are in the very intense yellow to orange range. 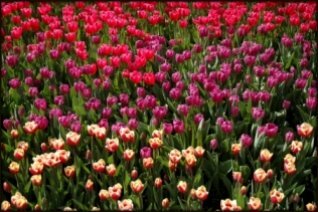 The mid range tulips in this photo dominate, but note that there is little difference in the value throughout the photo. This creates a very unified, almost monochromatic effect. 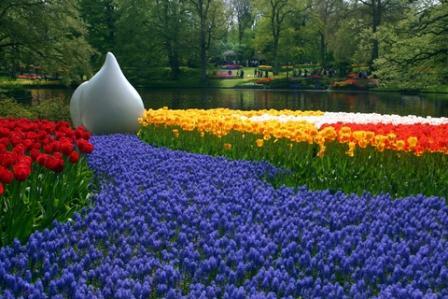 The values are very concentrated, and there is no relief from the powerful intensity in this dramatic garden. In the second photo, note that the color values are quite different. In the second photo, the entire range of light to dark values is present. In the foreground, bright, light values, in the middle distance, a deeper, darker value, and in the background a daring brighter colored pink. 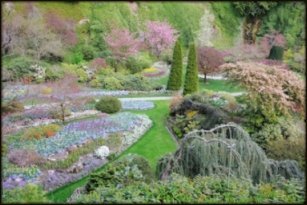 This causes the darker color in the middle distance to retire, giving the entire garden a more restful sense, allowing the eye to pick out colors and rest at many places within the garden. See how powerful this is? 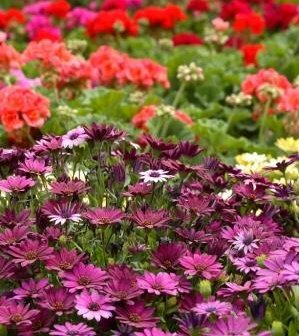 If you understand and use color values effectively, you can create a garden that shines, and that you can be very proud of. Using value as you might a paintbrush can create some very dramatic and beautiful effects. Here, using different strains of grape hyacinth, the garden artist has created the illusion of water, contrasting darker color values of blue against lighter purple colors. 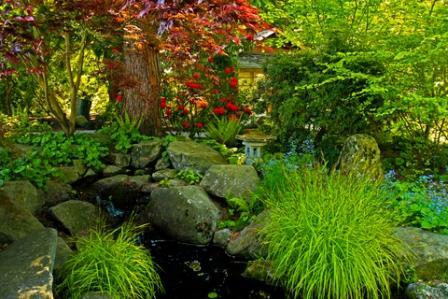 No one can argue that this garden is jaw dropping. This use of this powerful tool is not limited to plants. 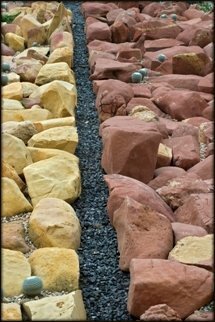 As seen near the top of this page, you can use this same technique to create drama with hardscapes. Below, you see several examples of using manmade objects to aid in creating an effect using value. 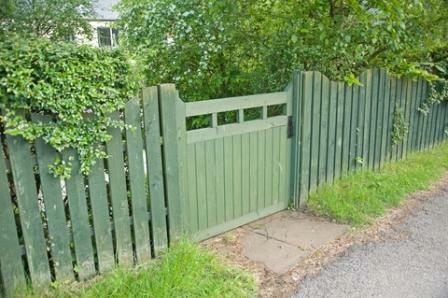 A muted green fence with green foliage adds up to a restful view, inviting one in to stay a while. 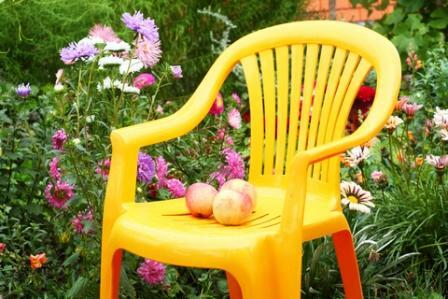 As you can easily see, understanding the use of value can invigorate your garden and help you to create high drama, or subdue the effects of your garden to create quiet, restful places. Be sure and check out the Elements and Principles of Design Page for more great tips!